Heat the oil in a skillet over medium heat and add the onion. Cook, stirring often, until onion is tender. 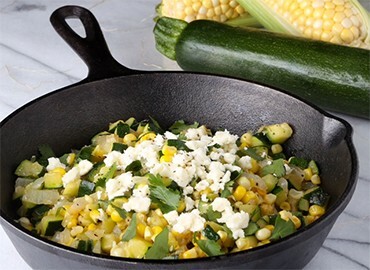 Raise the heat to medium-high and add the zucchini and corn. Season with salt and pepper and sauté, stirring often, until vegetables are cooked to your liking. Remove from heat and top with cheese and fresh herbs if available.